Echuya Batwa, more commonly known as Pygmies, are the most marginalized, vulnerable and voiceless group of indigenous people in Uganda. The Batwa were the original dwellers of the jungles of Bwindi and Mgahinga, but their lives changed forever with the establishment of the National Parks. The Batwa were called the ”Keepers of the Forest” because they lived in harmony with the jungle, in small huts made out of leaves and branches. They hunted small game using bows, arrows, or nets and collected plants and fruits in the rainforest. As hunter-gatherers, they frequently moved in search of fresh supplies and food. Some anthropologists estimate that pygmy tribes like the Batwa have existed for at least 60 000 years in the rainforests of the equatorial Africa. Despite their long historical existence and wide acceptance as the original inhabitants of these areas, they don’t have any legal titles to the lands. 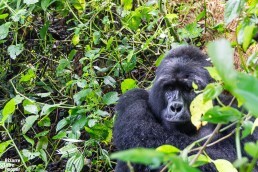 Therefore, when Uganda Wildlife Authority established the Bwindi and Mgahinga National Parks in 1991, the authorities were able to evict the Batwa from the forests. The Batwa didn’t receive any compensation and were driven to live on the edges of the Ugandan society, experiencing systematic and pervasive discrimination. The Batwa became conservation refugees. Many Batwa died during the first years of exile from their ancestors’ lands, and the Tribe faced a serious threat to their existence. Since the beginning of 2001, their situation has improved with the aid of different NGOs and other foreign help. 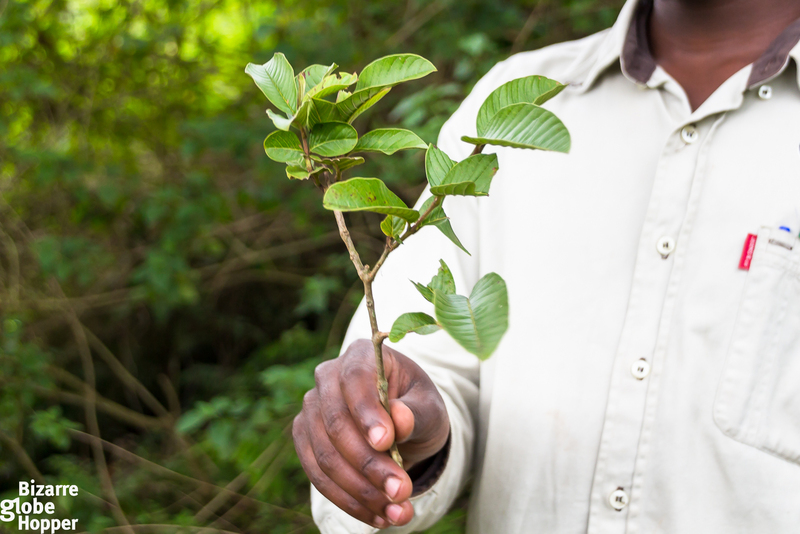 Especially the Kellerman Foundation has done a lot to improve the situation of the Batwa. Their overall position is still far from good though the establishment of the Batwa Development Program (BDP) in 2008 has resulted in some significant improvements, too. 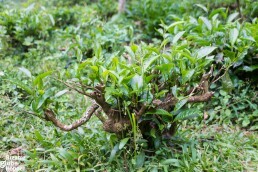 How can you visit the Batwa? You can visit this interesting pygmy tribe near the Bwindi Impenetrable Forest National Park. 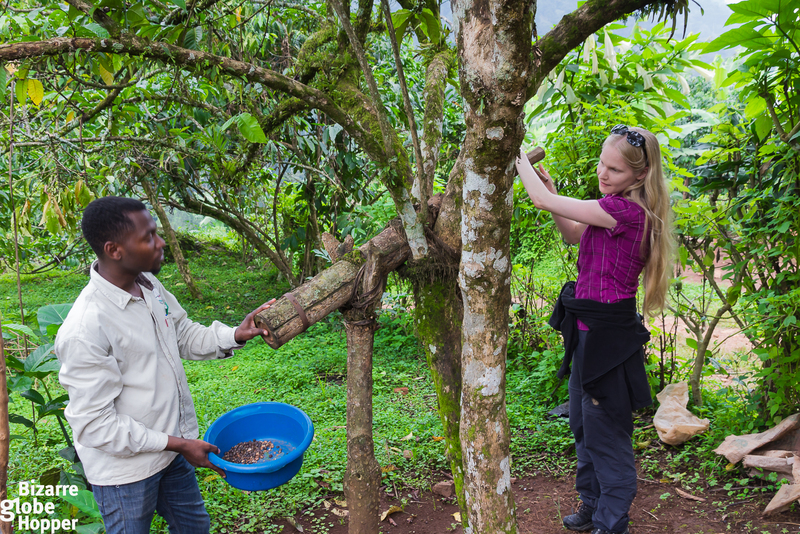 One of the options is to take the Batwa Experience.  The program is created by the Batwa pygmies themselves to educate their children and to share their heritage and traditions with the rest of the world. 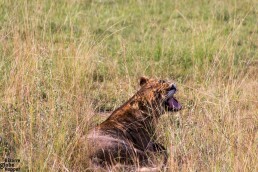 The other option is to arrange a visit by yourself via your tour operator or guide as we did. 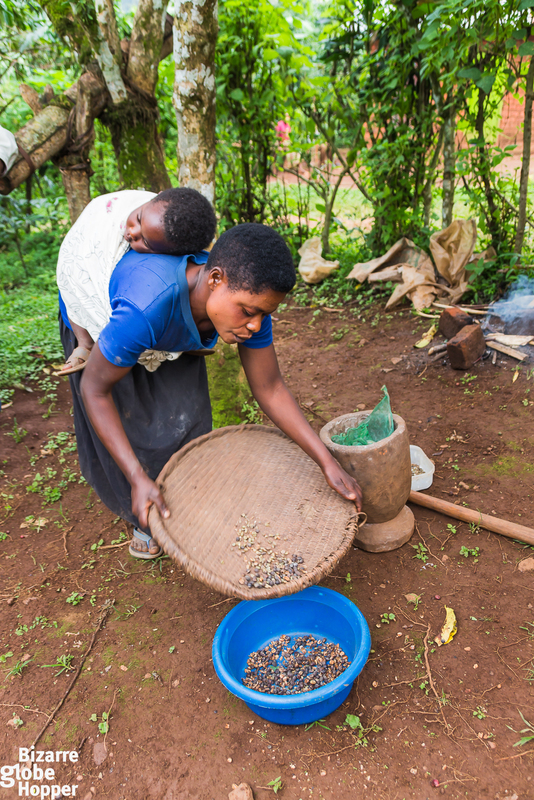 In both options, the majority of your contribution is going straight to benefiting the Batwa community. It’s eco-tourism at its core meaning and will give you an unusually authentic and memorable experience of a marginalized culture. We got to choose what we’d like to see during our visit to the Batwa community. Initially, we wanted to visit only about three locations, but eventually ended up visiting them all and didn’t regret it. Not even when we were high on the hills at a Batwa house, and it started to pouring rain – just a moment before we had to leave back to our lodge. The darkness had begun to descend, and it would make the already slippery, steep trails almost impossible to walk. But let’s get back to the beginning. 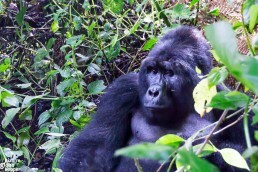 We met our guide at our lodge, and we walked about 15 minutes outside of the main village and lodges of Bwindi. Our guide was telling us some general information of the Batwa and soon we came to an area of small, wooden houses, inhabited by locals alone. 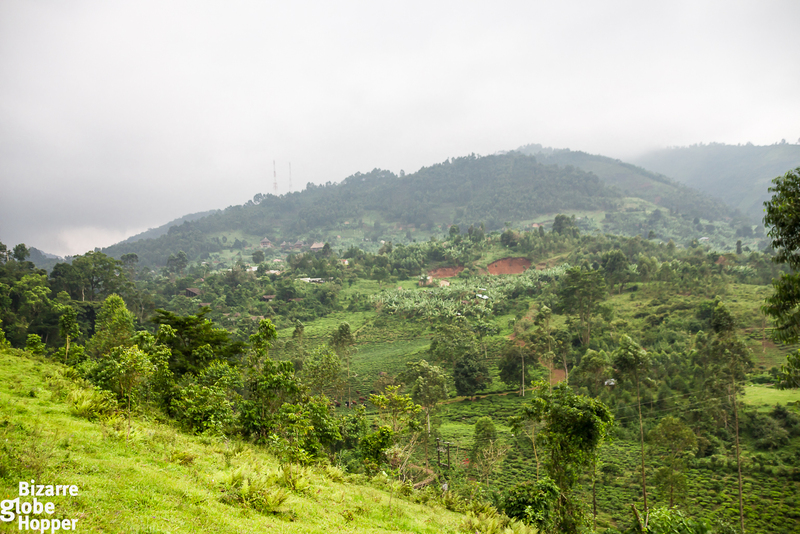 Our visit was a trail, eventually leading to the misty hills above the village of Bwindi. We started out by visiting ”a one woman coffee factory”. A woman with an infant sleeping peacefully on her back showed us how she did it all by herself, from picking the coffee beans from her few bushes to making a cup of coffee on the open fire for us to enjoy. 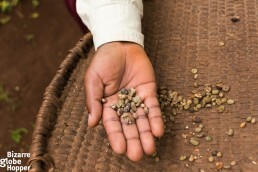 We even got to try grinding the coffee beans on the makeshift, wooden grinder. It was not easy, nor a light job. After sipping our cups of freshly ground, black coffee, we continued to meet an old man who had a small tea farm. 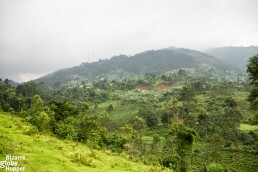 Tea farms are a common sight here, and the same old man had owned this little slice for 50 years. 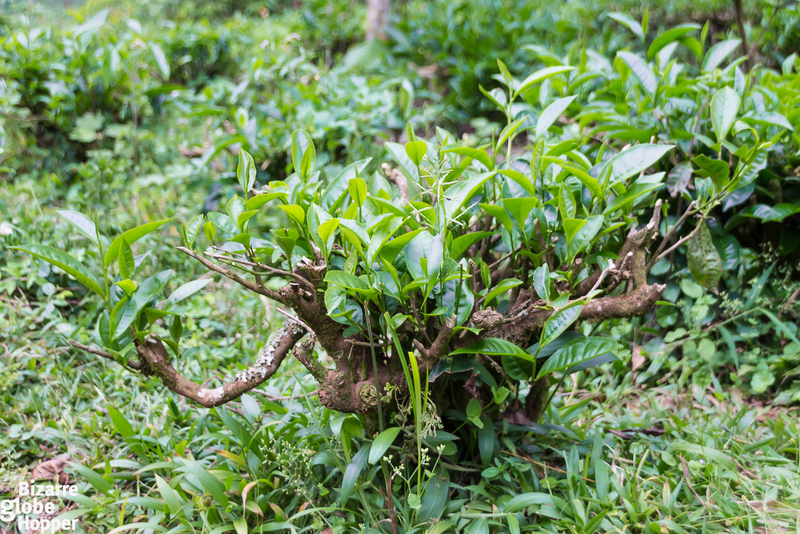 We learned the different phases of tea farming and soon afterward were met by another old man. He wrote poems with Braille and sang us a traditional song, accompanying himself on a stringed, self-made musical instrument. He also told us briefly about himself, of how he had lost his eyesight, and of how he began to write poems. It was nice meeting him, although it left us with a bit sad feeling. 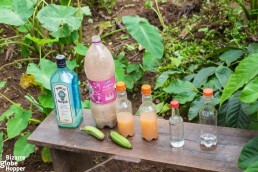 The next stop was one of the most interesting ones; we met a man who manufactured banana gin! 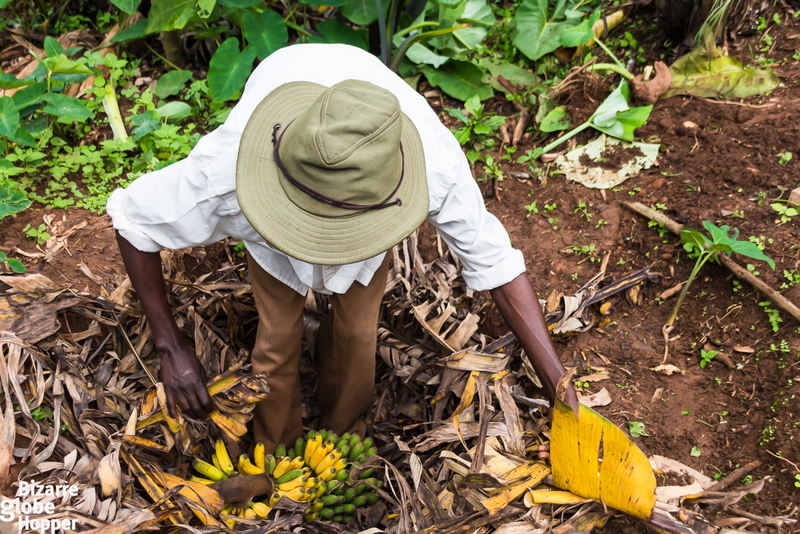 First, the bananas were dug into a whole, about a half meter deep and covered with a thick cover of banana leaves. 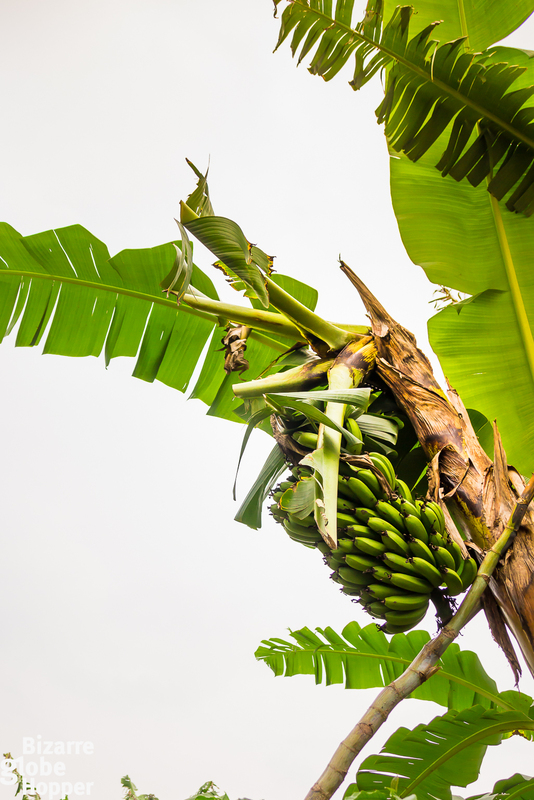 The bananas were left there to ripe for approximately 5-7 days. Then the ripe bananas are peeled and boiled. When boiling, the juice is filtered off through a clean, white cloth. In the next phase, sugar, yeast, soy milk, and some lemon juice are added to the liquid. That liquid is then put into a sealed container and it’s let ferment for about 2-3 months. 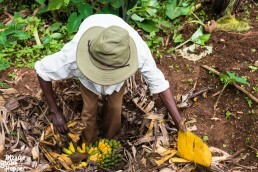 With the approximately same system, Ugandans also make banana beer and wine. It depends on how long the juice is being let to ferment. 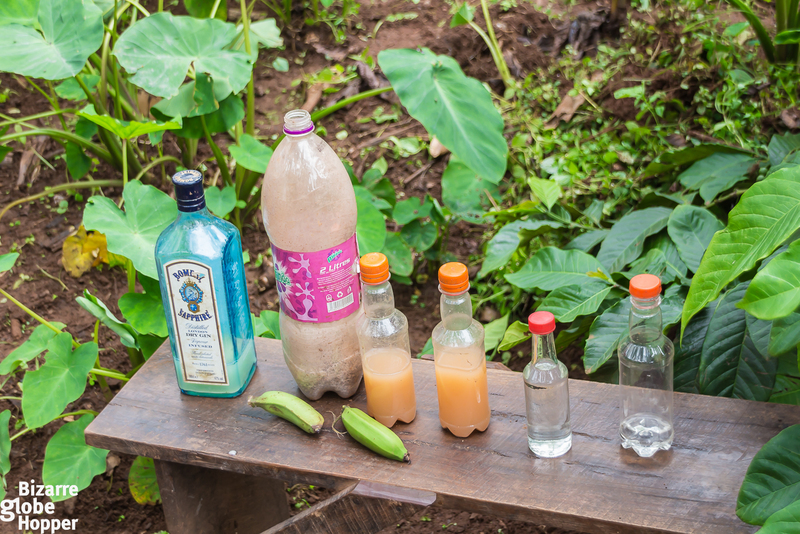 At the end of the demonstration, we got to taste the final product, banana gin, locally called “waragi.” “Waragi” is loosely translated as “war gin.” You could actually taste the banana in the clear liquid, but I couldn’t really say I liked the taste – even though I am a friend of gin. After the tasting of banana gin, the path started to ascend pretty steeply to the lush hills, and sometimes we hopped over slippery rocks in little streams, dodging the low hanging branches. After climbing for awhile, we saw a Batwa man wearing a hat made out of leaves, standing on an outcrop, waiting for us. He was the Shaman of the Batwa community. 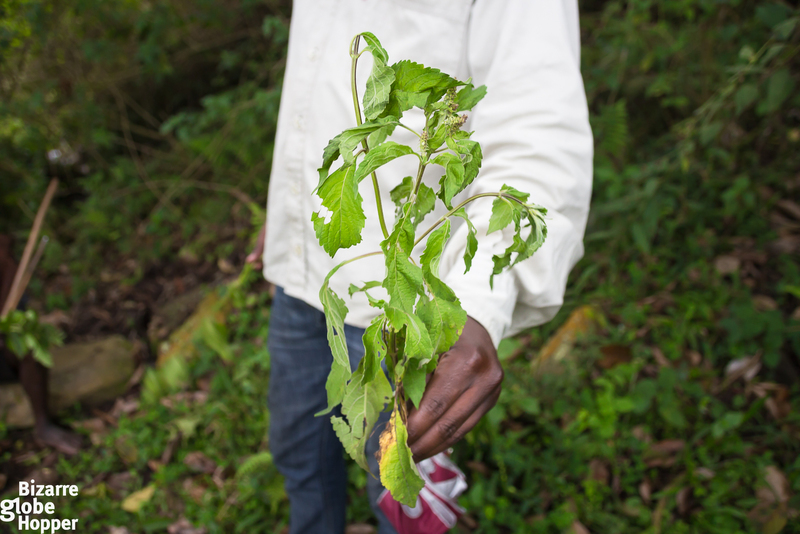 Our guide translated his words to us, and he showed us many medicinal plants and told us about what he can cure with them. I hope we would’ve had more time to spend with him since I would’ve liked to learn so much more about this spiritual and animistic side of the Batwa. They still use herbal medicine a lot, and the Shaman is a very respected person in the community. Check out the video about making a fire – traditional way with the Batwas! Unfortunately, we had one more place to visit still and the afternoon was already far, so we had to move on. 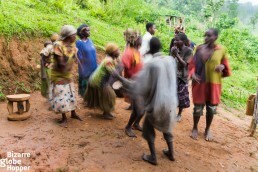 Even further up on the hill was a Batwa communal house of some sort and there were a lot of people wishing us welcome. They performed their welcome tribal dance and showed us how they make fire with a just a couple of wooden sticks and some thin wood slices. We tried that too and failed miserably. At the end of the tour we were supposed to plant a tree on the hill slopes as a remembrance of our visit, but soon after the fire making performance the threatening looking skies broke and rain started pouring down. It rained so heavily that the paths leading down became extremely muddy and slippery. The sky looked sleek gray, telling us that it wouldn’t stop raining for a good while. Because the dusk was already creeping in, we decided to put our raincoats on and start descending back to our lodge before dark. We didn’t have rain pants, and when we got back to Mahogany Springs, our pants were soaking wet. Luckily we had time for a good, hot shower to wash away all the mud after our interesting Batwa visit. And even though we got drenched, it was worth the effort to meet this marginalized group of people and see even a scratch of their endangered culture. 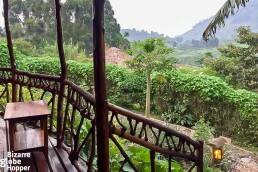 Where to Stay in Bwindi Impenetrable Forest National Park? 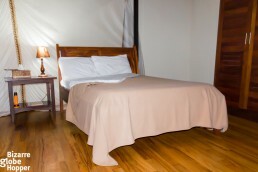 There are as many choices of lodging in Bwindi as there are different budgets. 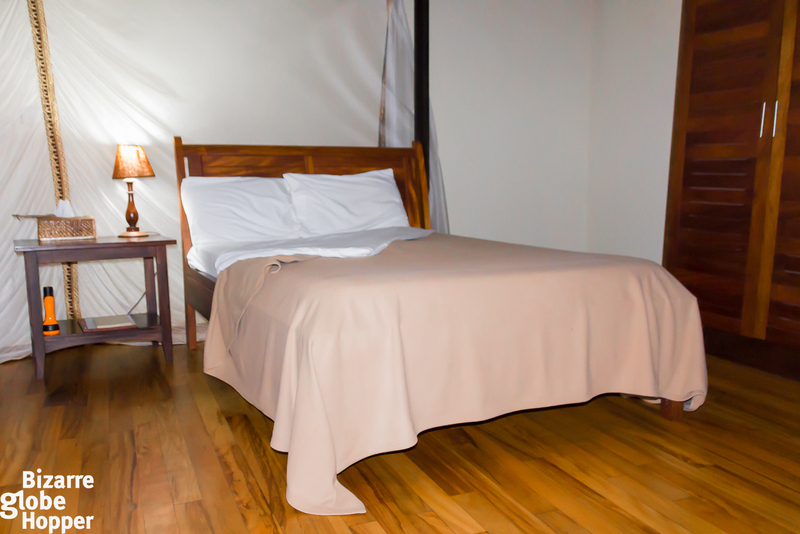 If you are looking for something truly comfortable and luxurious, with magical views of the cloudy hills and forests of Bwindi, your choice should be Mahogany Springs. 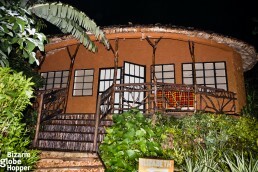 This lodge has comfy and spacious, private cabins spread around their premises, offering exclusive privacy and serenity. 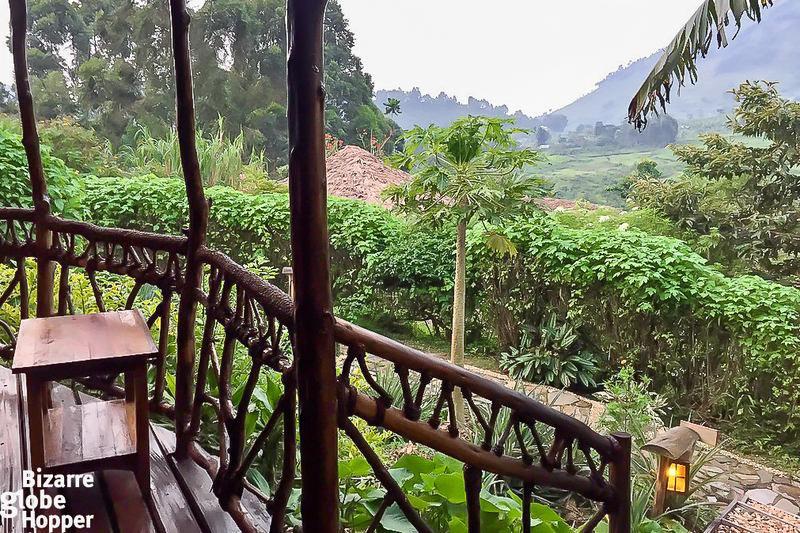 The restaurant of Mahogany Springs has the most spectacular views straight into the home of the mountain gorillas, and they provide great service. Enjoy a drink on the terrace looking to the hills or sit back on a couch, enjoying the warmth of the fireplace when the evenings get chilly. Either way, you will be totally relaxed while staying here. 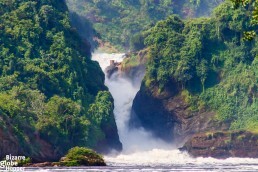 Mahogany Springs is also a perfect base for going gorilla trekking in Bwindi Impenetrable Forest, and the convenient situation is great for doing other activities, too, like visiting the Batwa. Have you visited an indigenous tribe like the Batwa? 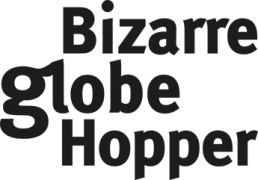 Who they were, where it was, and how was the experience? We’d love to know! 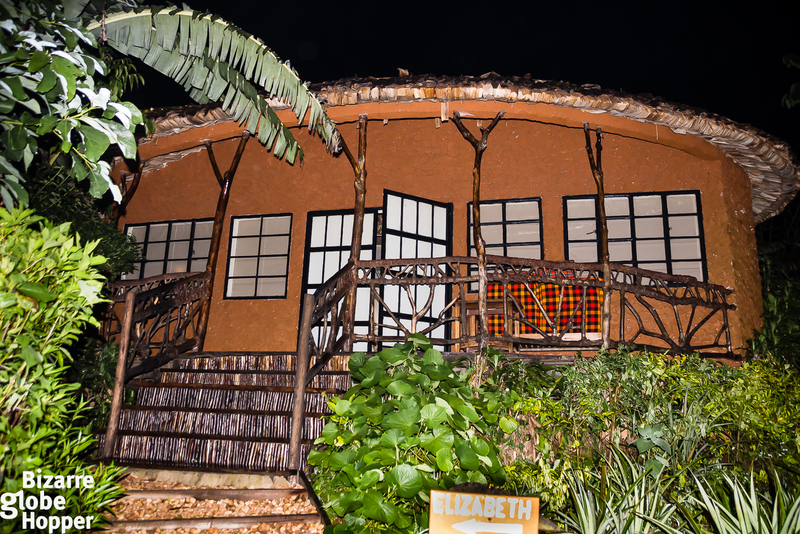 *Disclaimer: We were hosted by Mahogany Springs during our stay in Bwindi Impenetrable Forest National Park and by Mamaland Safaris on a tour around Uganda, but all the views expressed here are totally our own, honest opinions.